Dogs are no doubt man’s best friend! We love our furry four pawed friends, and we’d do anything for them – besides accepting a kiss. We all love our pets, they’re essentially our children or best friends. They are the very best companions to keep you up on a down day. Many of us show affection to our dogs in different ways, but you should never let the dog lick your face. Most people think that these are sweet kisses that you have to accept to make your puppy happy. However, it can also be deadly. Yes, I said deadly. 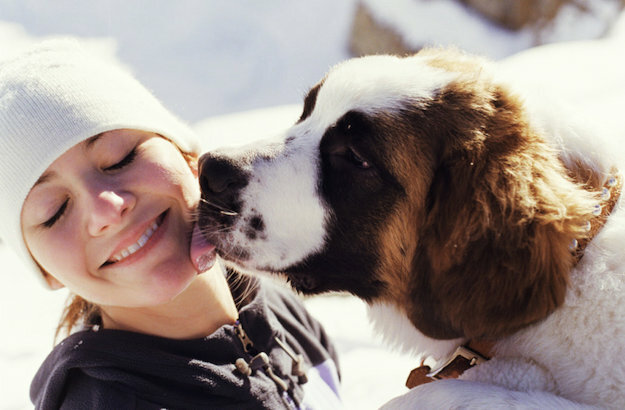 No matter how much you love sharing kisses with your pooch, you should never do this. Dogs have a massive amount of bacteria in their mouths that are sickening and poisonous to humans. Although sometimes our pups will be relentless until we accept their kisses, we must train them not to lick people! It might pain you to say no, but you have to! Some people believe the ancient myth that a dog’s mouth is actually cleaner than a human’s, but this is horrendously false. Experts revealed that dogs mouths are in no way cleaner than humans. This should be obvious due to their bad breath. You can even visually see how disgusting the inside of a dog’s mouth can get. I mean, how could you really think a dog has a clean mouth. “They raid the garbage can. You know, we give each other a peck on the cheek when we say hello, they give each other a peck on the rear end,” Marty Becker, dog expert, points out. Dogs mouths are not only dirty, they carry bacteria that are harmful to humans. John Oxford, professor of virology and bacteriology at the Queen Mary University in London, says it’s not just dog’s saliva you should be worried about. “Dogs spend half their life with their noses in nasty corners or hovering over dog droppings, so their muzzles are full of bacteria, viruses, and germs of all sorts,” he says as reported by The Sun. One serious disease that can be contracted from letting a dog lick your face is Capnocytophaga Canimorsus. It can cause fatal infections including sepsis, that leads to organ failure and death! The symptoms of the disease seem casual in the beginning, but it has a unique progression that is much quicker than most. Dogs can additionally pass ringworms and other parasites to their humans from licking them. Ringworms are actually extremely common and have been contracted by dogs in many instances. It’s just better to be safe than sorry, and as hard as it is to tell them no, we must deny our furry friend’s kisses! It’s in their best interest, right? Just give them a pat instead. It is well worth it.